Dozens of US military convoys will be hogging Europe’s roadways this week as part of an exercise designed to improve transportation logistics on the continent in case of war. But not all locals are happy about it. Destined for the three Baltic states and Poland, Romania, Bulgaria, and Hungary, the convoys are part of a brigade of 3,300 US troops, who along with their 2,500 pieces of equipment recently docked in Antwerp, Belgium. 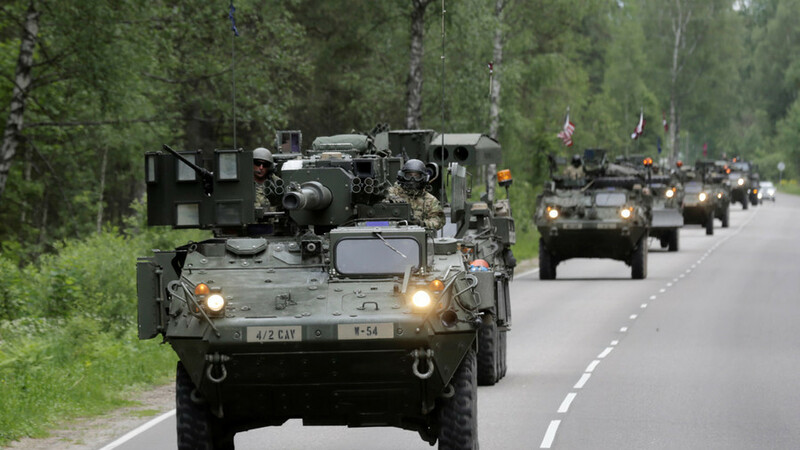 Their arrival in Europe is part of Operation Atlantic Resolve, Washington’s ongoing response to the Ukraine crisis and Crimea’s reunification with Russia in 2014. The military hardware will move across Europe via river barge, rail, and road. Officials described the deployment as a large-scale exercise focusing on improving logistics skills that would be needed in case war breaks out in Europe. The US troop movement across Europe has been described as one of the largest of its kind since the end of the Cold War – and, true to tradition, has already faced opposition from unwelcoming locals. US convoys traveling through Germany on their way to Poland have faced the discontent of locals – and governments. “I think that it doesn’t help us in the long run if tanks drive up and down both sides of the border,” Dietmar Woidke, Brandenburg’s state premier, said earlier this year. However, a government spokesman took a more neutral approach to the troop movements in a statement released on Monday.